Brief Description: Circles and arches of dead, flattened grass ranging from inches to feet in diameter. Spring Dead Spot is a lawn disease caused by the 3 different types of fungi, Ophiosphaerella korrae, O. herpotricha, and O. Narmarri. The O. korrae variety of Dead Spot can cause a secondary lawn disease called Necrotic Ring Patch to appear later in spring or in the fall. Spring Dead Spot works underground, causing the roots of the affected grass to rot, blacken and cease to grow. The disease will appear almost exclusively on Bermudagrass but may also appear on Buffalograss. On Bermudagrass lawns, Spring Dead Spot generally appears 3-4 years after the lawn is seeded, and, if untreated, will cease to appear 7-10 years after its first appearance. As its name suggests, Spring Dead Spot first appears in the spring. 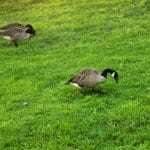 However, the infection of your lawn by the disease actually takes hold in the fall, going dormant in the winter and becoming active again as the weather warms. 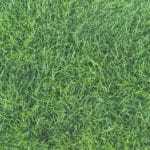 As Dead Spot causes the roots of the grass to rot and die, the grass ceases to absorb water or nutrients and therefore ceases to grow. The grass then turns yellow/brown and, without roots to support it, falls flat, creating depressions in the lawn. The circular and arch-shaped dead patches created by Dead Spot may grow together, forming irregularly shaped patches that are harder to identify as dead spot. 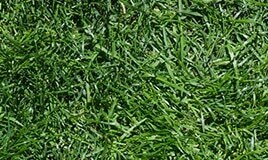 Because other lawn diseases such as Dollar Spot are similar in appearance to Dead Spot, you may want to dig up a portion of the yellowed grass and check for the blackened, rotting roots that are the signature effect of Dead Spot. Regular Bermudagrass roots are long and pale by comparison. You can help to prevent Dead Spot by keeping your lawn’s pH level below 7. 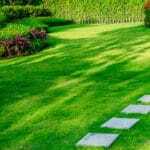 Avoid applying nitrogen fertilizers to your lawn in the summer, and don’t let grass grow overlong. 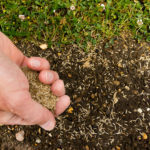 In addition, aerating your lawn can improve drainage and keep your lawn from creating the moist conditions that fungal lawn diseases grow best in. Suppressing this disease after infection using fungicides is not recommended, as attempts at fungicide-based removal of Dead Spot seems to prove effective some years but not others, and rarely removes the entirety of the disease. Consider fungicide a better prevention tool, and only use it as a treatment if the disease is no longer controllable.